Forget Long Queues. Eat Out Manila Gives You An Easier Way To Eat Out In Manila! Filipinos love to eat! At home, an average Filipino eats about 5 to 6 times per day: breakfast, morning snack, lunch, afternoon snack, dinner or supper, and midnight snack. But their love for food is not restrained to the confines of their home, it seems. Filipinos also love to eat out. A survey conducted by Looloo Insights showed that out of at least 422 respondents, 26% eat out every day, 13% eat out 4 times a week, 43% eat out 2 times a week and 18% eat out once a week. So yeah, it really does look like Filipinos love to go looking for good food out from the four walls of their homes. But eating out in the metro is no easy task. Finding a great place to eat can be such a hassle and getting a seat at your fave restaurant could also prove to be a difficult task. The latter became such a huge challenge that Iñaki Lamata and a cousin who is based in Spain created a new app to solve it. Long lines and wait times be gone! 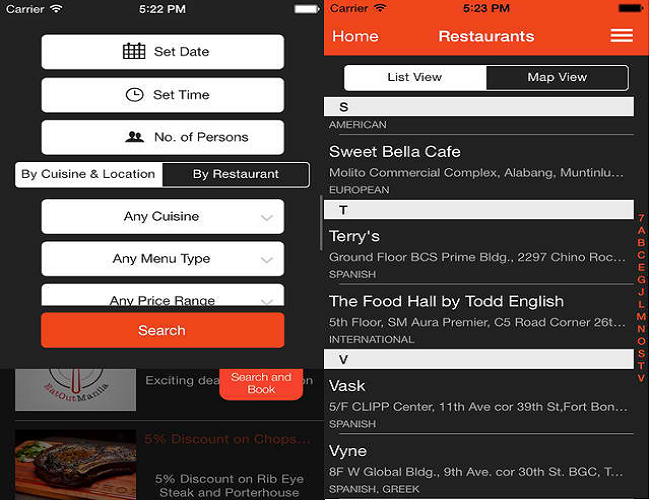 The new Eat Out Manila mobile app aims to make your next restaurant reservation a lot easier. 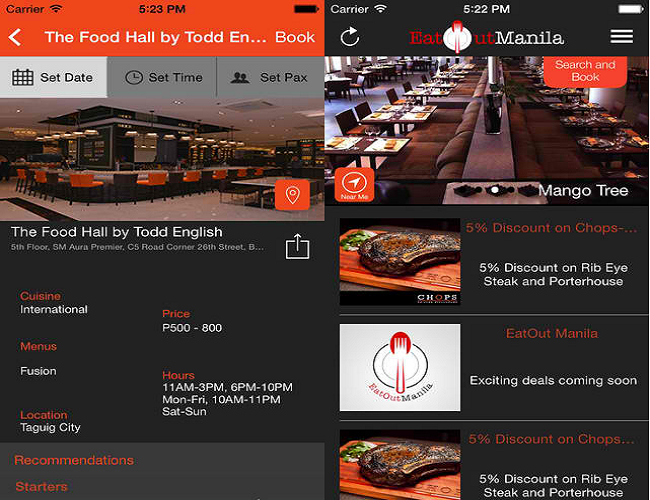 Image Credit: Eat Out Manila Inc.
Eat Out Manila lets you book restaurants via the app or online for free, meaning no more phone call charges. 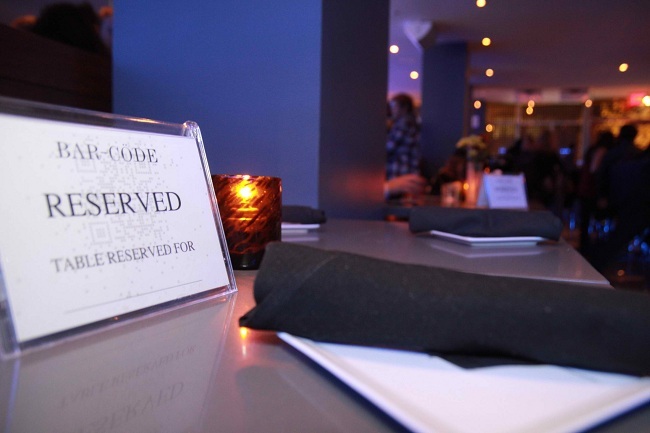 To reserve a table, simply set the date, time and number of persons, then click “book” and “confirm”. You will receive a reference number via SMS and email afterwards. The app’s search function looks poised to be a useful one. You can look up restaurants by name, cuisine, and locations; or refine your search by restaurant type and price range. On the specific restaurant page, you will also get to view their menu and any discounts, gift certificates or freebies directly from the partner restaurant. The app has a feature that allows you to cancel a reservation, but be warned. Not showing up for your reservation 3 times will cause you to be blocked from using the app. You will only get a strike if upon checking and validation, it was discovered that you just totally disregarded your reservation. However, if Eat Out Manila determines that you have a valid reason, then you won’t be marked as a no-show. 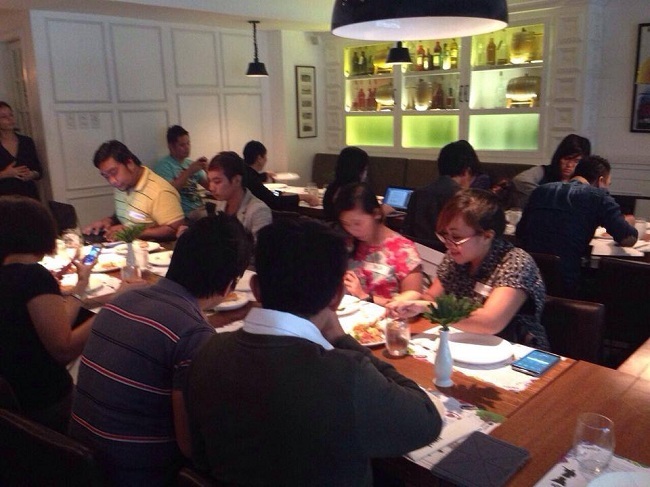 The Eat Out Manila mobile app was launched on August 28. Its partners include more than 100 establishments, including Rambla, Red Crab, Lulu, Vyne, Las Flores, The Glass Door, Corazon, Elias and Abe, among others. According to Interaksyon, Eat Out Manila aims to partner with 350 to 400 more restaurants before 2014 ends. There are also plans of launching Eat Out Cebu and Eat Out Boracay. Make a reservation and invite others. Also read: Are We Spending Too Much Time On The Phone While Dining Out?